(Pelham, Alabama) — The third edition of MEGA RED (the Deluxe Edition of the Guide Book of United States Coins) officially debuted at the Whitman Coin and Collectibles Baltimore Expo, March 30, 2017, and now is available nationwide. 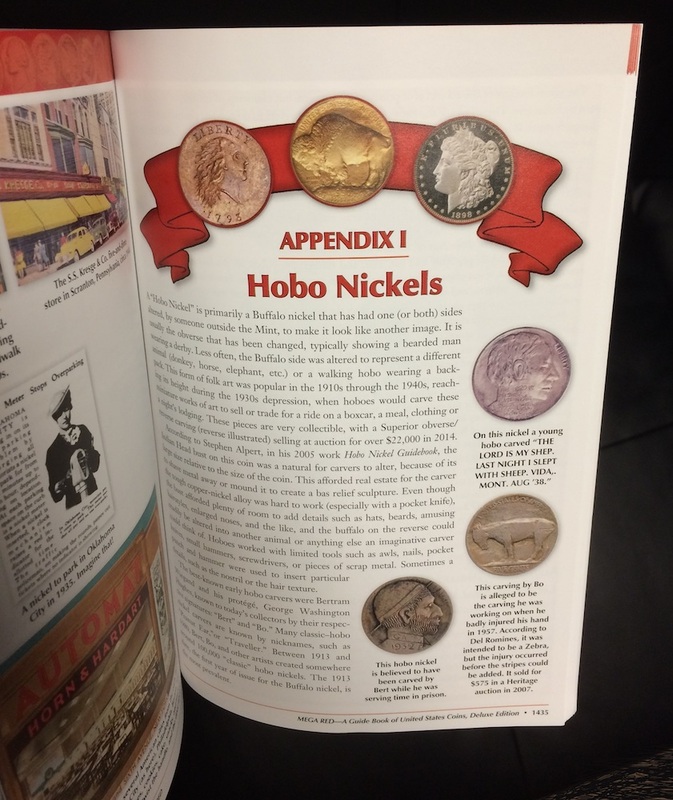 Among the book’s special features is a nine-page full-color appendix on hobo nickels. A hobo nickel is a Buffalo nickel with one or both sides altered by someone outside the Mint to make it look like another image. Often the Indian would be carved into a bearded man wearing a bowler hat, or the buffalo into a donkey, or (turned sideways) a man carrying a knapsack; sometimes political or social messages would be added. This form of folk art was popular in the 1910s through the 1940s, reaching its height during the 1930s Great Depression. Hoboes would engrave miniature works of art to sell or trade for a ride on a train, a meal, clothing, or a night’s lodging. Hobo nickels are very collectible. The Money Museum of the American Numismatic Association displays a collection of the coins, and active hobbyists convene in the Original Hobo Nickel Society (OHNS, online at www.hobonickels.org). In 2014 an example featuring both obverse and reverse carvings, graded as “Superior,” sold at auction for more than $22,000. Mega Red’s richly illustrated appendix pictures dozens of hobo nickels from the Classic, Later Classic, and Modern eras, with enlarged photographs. It references the research of numismatists including Stephen Alpert, Marc Banks, Arturo DelFavero, Don Farnsworth, Bill Fivaz, Gail Kraljevich, and Del Romines. Each level of the grading system for hobo nickels (Superior, Above Average, Average, Below Average, and Crude) is illustrated with examples. Included are hobo nickels created by the most famous carvers of the Great Depression, Bertram “Bert” Wiegand and his protégé George Washington “Bo” Hughes, as well as artists whose real names are lost to history but whose styles are identifiable: Peanut Ear, Traveler, Rough Beard, and others. The works of well-known modern engravers are also discussed: Ron Landis, Joe Paonessa, Alex Ostrogradsky, Howard Thomas, Chad Smith, Keith Pedersen, John Schipp, and Aleksey Saburov. And the appendix includes a feature on the only Classic-era hobo nickel carver of whom a confirmed photograph exists: William Sharples (1902–1971), a tool and die engraver from New Jersey. Billed as the “biggest, most useful Red Book ever,” MEGA RED measures 7 x 10 inches and has 1,040 more pages than the regular edition. The larger size and increased page count combined make MEGA RED five times bigger than the regular-edition Red Book. It prices 8,200 items in up to 13 grades each, with 48,000 individual values and 15,400 auction records covering circulated, Mint State, and Proof coinage. The book is illustrated with 7,000 images, including 2,434 that are new to the third edition. MEGA RED retails for $49.95 and is available online (including at Whitman.com) and from booksellers and hobby shops nationwide. Whitman Publishing is the Official Supplier of the ANA, and Association members receive a 10% discount off all purchases.